One of the things that has immediately become a “struggle” for me is wanting to take the credit for the weight loss that I have had so far. Even writing that makes me want to laugh at myself because I remember where I was before all this… and lemme tell ya… I was in the land of UNable! 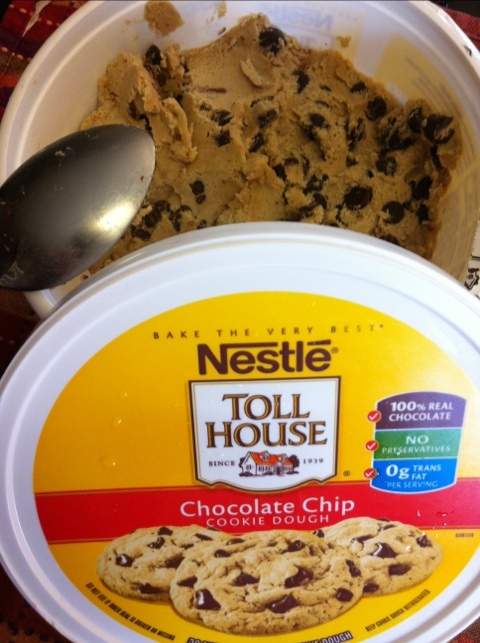 I know that I have mentioned my cookie dough… experience… multiple times but that was really just rock bottom for me. Before that, there had been years of smaller bits of resolve, struggle, eventual failure, and then a tumbling into eating anything and everything… and with every bite reminding myself: YOU CAN’T DO IT. YOU ARE A FAILURE. But ya know, I was so right. And when I am tempted now to think that my new found control is mine, all I need to do is remember the cookie dough day, the apple crisp struggle, or even any of the many “pre-covenant” uncatalogued lost battles with Oreos, Girl Scout Cookies, tortilla lime chips, the countless bowls of brownie batter followed by the pan of baked brownies, chocolate chip cookies, breadsticks, cheese tortellinis, etc. etc. etc. Yesterday I made another meal for some friends and I decided to make them some chocolate chip cookies for dessert. Last week I bought one of those tubs of Toll House cookie dough at Target to make cookies for another family and still had some left so I figured that would be an easy dessert option, plus I like that I don’t have to make 3 dozen cookies like when I make it fresh. Anyway… sorry, I just love random and pointless details. If you don’t know me, imagine me telling a story… I take for.ev.er. And again I digress. So, yesterday when I was making them it was this nice leisurely June Cleaver type experience (well if you don’t include the fact that I was making cookies with pre made cookie dough)… the boys were playing sweetly by themselves with toys, I was wearing an apron, the kitchen stayed clean the whole time. This was a perfect opportunity to indulge… or get lost in the moment… or to simply perfect the gloriousness of my life right then with a little snippet of cookie dough. I mean, it looked sooooo inviting. sooooo chocolate chippy. sooooo delicious! I didn’t do it this time (wahoo!) because I thought of my “issues” with cookie dough and of my confessional post, Cookie Dough Syndrome. I think it was kind of like having a memorial stone in my mind, having written that post. And I was wondering just now why I was tempted yesterday when I was making the cookies but not on Wednesday when I was making them. The main difference that I can figure out is that on Wednesday, I was rushed. It was not a June Cleaver moment. The boys were not playing sweetly. I was not wearing an apron. And the kitchen was not clean. Honestly, I think it was that I didn’t have time to think about cookie dough on that day. Now. I’m not saying that keeping myself busy is going to be a fix for not being tempted. Being busy is what led into a lot of my overeating- I would grab a bag of chips an chow the whole thing while I was busy being busy. Or I would not eat at all while I was busy and would then eat everything in the pantry because my that time my body needed so many things I couldn’t distinguish a craving from another craving. At the same time, being calm and carefree isn’t the answer either. Summers should have been the time when I would lose weight… I would be so active, swim a lot, and be always out and about but as I have said before, eating for me was not about being hungry. And a big reason that I have eaten during my life was because I was bored. And… well, summer can get boring (at least before I had two kids and a husband it could)! So again, the answer came back to this covenant. This desire to please God. Whether I thought all the way through that yesterday or not… it is now becoming a part of me, flowing just beneath the surface of me. And again I realize how important it will be, once this year is over, to keep some kind of “food covenant” with Him for the rest of my life. Because I don’t want this cookie dough success to turn back into a cookie dough syndrome. I want the success to be… for.ev.er.